*Disclosure ~ I was provided with Glade Products for free in order to test and give an honest review. The opinions expressed here are my own. It’s been a rough four or five days around here. Thursday our son, the electrician, was electrocuted at work. He was hurt enough to end up at the doctor but not bad enough to be h0spitalized. We’re definitely thankful for that! However, as you can imagine we were scared to death! Today we had to put our sweet cat, Bella, to sleep. She had been fine and suddenly became very ill very fast. Unfortunately we didn’t realize how sick she was and my poor husband went to the vet with her, alone. She was such a good cat and we will really miss her. Do you have fur babies? So, onto something happy. Glade reached out to me a few weeks ago to share some really interesting information about a recent survey conducted by Glade. The survey showed that while 4 out of 5 Americans are consciously aware of how scent can inspire a mood or feeling, 50% would give up their sense of smell if they had to lose one sense. I was really surprised by this. I have a friend who has lost her sense of smell – due to a virus they believe – and I know it makes her quite sad not to be able to smell everyday things like flowers or perfume. What do you think… would you prefer to give up your sense of smell if you had to choose one of your senses to give up? When I think about never being able to smell pumpkin pie again and the memory it provokes of family Thanksgivings spent together – it makes me very sad. I also couldn’t imagine not smelling the first whiff of Lilac in the Spring and how happy that makes me. How about the sweet and spicy smell of cinnamon and the memories of baking Christmas cookies with family during the Holidays? What memories do certain smells bring back for you? 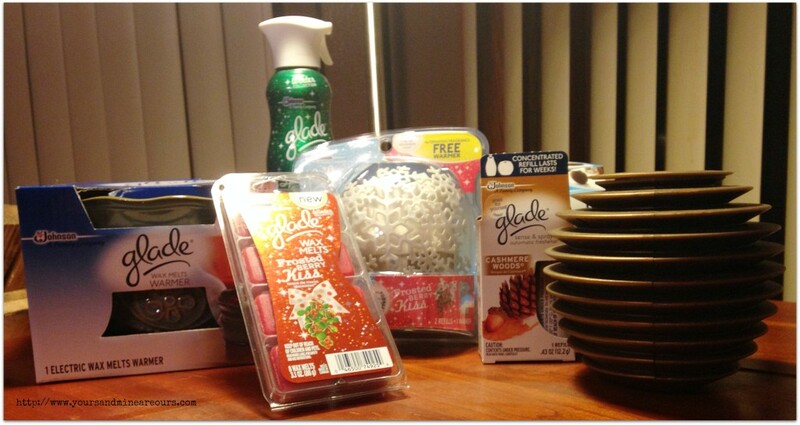 Speaking of scents Glade provided me with an awesome package of products to test! Opening the box was like Thanksgiving and Christmas all wrapped into one. Yum! Have you saw or had a chance to try their new Glade Wax Melts or the Glade Sense & Spray Automatic Freshener? They are awesome! I love how they look in my house, they are very stylish and blend in well. The smell is amazing and lasts forever. The price is reasonable and well worth the minimal cost. There are four new Limited Edition Seasonal Scents available and you have to try them all … well… because they are all awesome! I truly do love them all but Frosted Berry Kiss is my favorite. I have a surprise for you! Glade is going to give one lucky reader their very own assorted product package with one of everything shown in the picture above! Yay! How awesome is that? To enter just use the Rafflecopter below. The Christmas tree scent reminds me of being a little girl and going with my Dad to find the perfect Christmas tree! strawberry reminds me of my papaw. in the summer, he worked in a strawberry field and would bring fresh strawberries home for us!! Orchids always remind me of my grandmother because it was her favorite flower and scent. cinnamon every time I walk by the candles or any decorations that has that smell on it I think of my sister her house use to always smell of it. A special memory that a scent reminds me of is my dearly departed Grandma. She was a classy lady. We lived in Michigan where the 4 seasons are so evident. She had a different scent/perfume for each season. This time of year she wore Cinnabar perfume by Estee Lauder. So especially this time of year, whenever I smell cinnamon, I think of her and it warms my heart. :) *sigh* I miss her. This may sound crazy, but when I smell chocolate Hershey's Kisses, they remind me of Christmas growing up. My mom would always have a big glass Christmas tree jar filled with them. Growing Up At Spent A lot Of Time With My Grandma, She Would Make A Huge Breakfast That Included Fried Apples, So The Smell Of Apples Always Reminds Me Of All Those Great Memories Spent With My Grandma! Cinnamon buns remind me of my Mom.